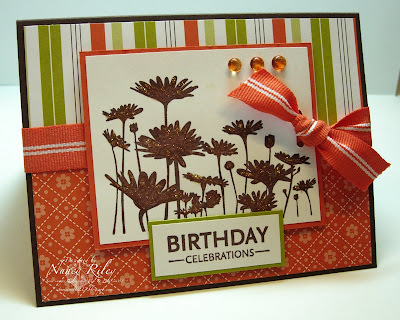 Today's Featured Stamper #82 on SCS is NikiE. 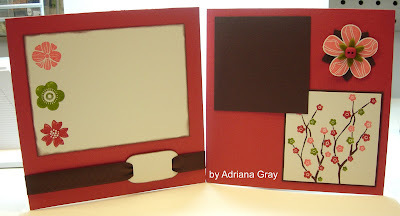 HERE is her fabulous gallery, and HERE is her card I chose to case for the challenge. Things I changed include: a) different colors/papers ... the new SU In Colors of Baja Breeze and Pink Pirouette paired with Chocolate Chip, b) used the new Flower Fusion Too as my main image flowers and Styled Silver Hardware Brads in the flower centers, c) used Designer Label Punch for my sentiment, and used a different sentiment, and d) used the Ticket Corner Punch on the corners, and added Silver Brads. The sentiment is from the new Level One Hostess Set called Best Yet. 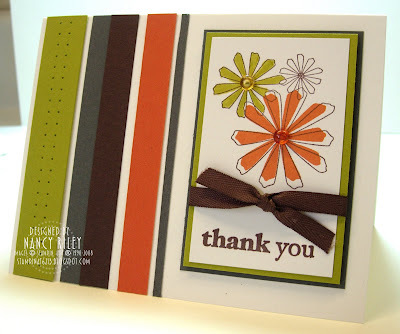 The sentiment is punched with the Designer Label Punch, and is backed by punching Baja Breeze CS TWICE and staggered. The striped Baja Breeze DP is from the new Manchester DP, and the Pink Pirouette DP is from Bella Rose DP. I was so happy to see that Stampin' Up! came out with a cupcake themed stamp set in the new catty, Crazy for Cupcakes! I love these images paired with Sweet Always DP! The Sweet Always DP reminds me of Dunkin' Donuts and Baskin Robbins ... the color combo of Chocolate Chip, Regal Rose, Pink Pirouette, and Pumpkin Pie just screams, "SWEET"! This weekend couldn't have come soon enough because I've had new rubber sitting here calling my name since Wednesday. This card came together rather quickly, but you would laugh if you knew how many times I tied and re-tied that ribbon! I just couldn't get it to look right, nor could I decide whether to use the Tangerine Tango, or the Kiwi Kiss 5/8" Striped Grosgrain Ribbon. 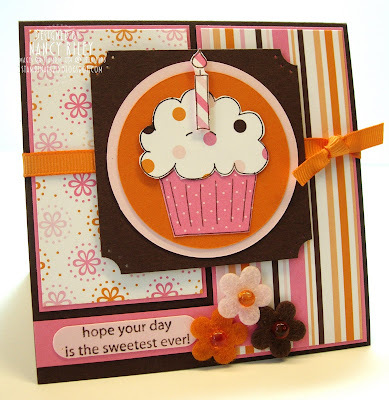 Taylor VanBruggen's Cupcake Challenge #31 seems the perfect fit for my new stamp set, Upsy Daisy, and a great opportunity to use Hawaii Papaya DP from the new 2008 Fall-Winter Idea Book & Catalog. It's difficult to see in the photograph, but I added Diamond Stickles to the Upsy Daisy image for some sparkle and depth. 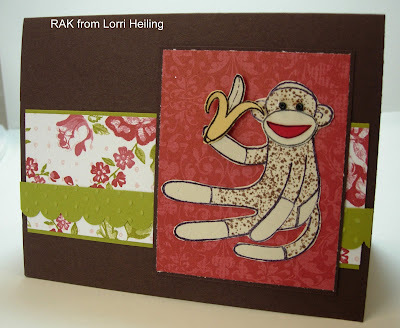 Each month, Lorri Heiling's SU demo family and mine, i.e. weSTAMP, meet for a business meeting and swap. Since my focus the last few weeks has been on returning to full-time work (and I promise that's all the whining I'll do about it in this post! lol ! ), I didn't play an active role in this month's meeting, and I didn't even swap! ... pretty much all I did this month was attend and enjoy. 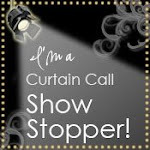 I don't have photos of everything from the meeting like I normally do so please head on over to Lorri's blog, Confessions of a Stamping Addict to see ALL the swaps, the door prize, and more! Everyone in our weSTAMP group received this CD of convention photos! Linda Bickley designed and made the CD holders ... beautiful job, Linda! Adriana Gray's husband, Drew burned the CDs for us AND made a really neat etched design on the CD, going way above and beyond! So much talent in our weSTAMP family! 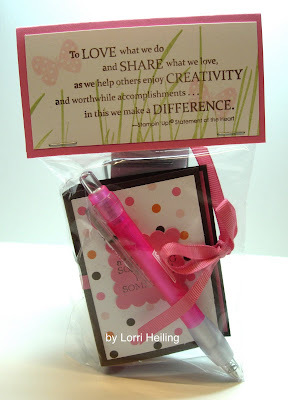 Everyone also received this fun package of convention goodies designed and created by Lorri Heiling! Each package contains a Stampin' Up! 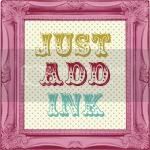 writing pen and a Stampin' Up! lip balm in a lip balm holder designed by Lorri. 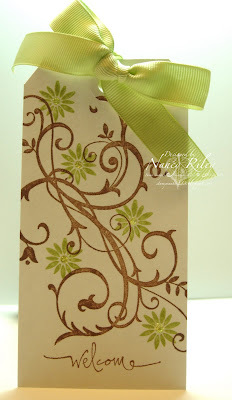 I love how Lorri used the Stampin' Up! Statement of the Heart for the bag topper! 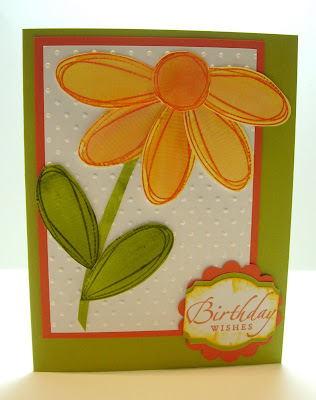 This fun card was our Make 'n Take for the evening provided by Pam Wood. Pam is always teaching us new techniques and new ways of doing things, and this card was no exception. We water colored the flower from Pick A Petal. I love the new In Color combination of Kiwi Kiss and Tangerine Tango! Our swap theme this month was a 6 x 6 double page spread. Again, I didn't swap so I don't have photos of all the swaps. 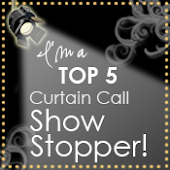 (Be sure to go HERE to see them all). Adriana Gray and Jessica Blair included me in their swap count anyway ... they are incredibly sweet! 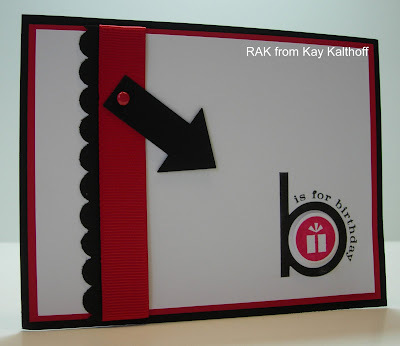 This first card is a RAK (Random Act of Kindness) from Angie Tieman. Angie's blog is SCHWOO! ... you must visit ... she's been going crazy creating with new SU products! 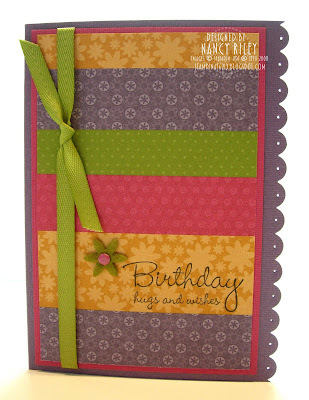 Her beautiful card uses lots of new products from the new 2008 Fall-Winter Catalog & Idea Book ... Bella Blossoms stamp set (pg. 102), Bella Rose DP, Button Bouquet, and Riding Hood Red 5/8" Striped Grosgrain Ribbon. Yesterday, I received the most wonderful care package in the mail from Hawaii ... more specifically, the amazing Jen Tapler, JenTapler Designs! 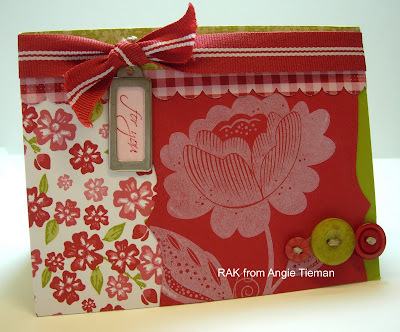 Jen used Summer Picnic DP to create the beautiful hand stamped card, notebook, jumbo paper clip, and bag topper. She also included some wonderful Hawaiian chocolates! To see more details about Jen's creations, see her post HERE ... her photo of the goodies is better too! 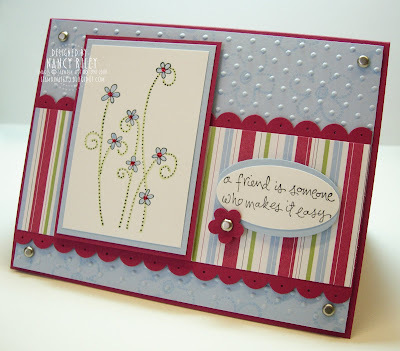 Today's Featured Stamper #81 on SCS is Patricia, Kokirose on SCS. HERE is Patricia's card I chose to case. I changed the stamp set to Simply Said and the colors to those from Cutie Pie DP ... Purely Pomegrante, Bashful Blue, and Certainly Celery. I used X-Mas Red Stickles for the flower centers. They really sparkle IRL, and was impossible to capture in the photo. The oval sentiment is backed by two staggered Bashful Blue ovals of the same size. The scallop border was created with the new Scallop Border Punch, and I used my Paper Piercer to add a hole on each scallop. I used the flower outline stamp from this stamp set for the Bashful Blue background piece by stamping in Versamark before running through the Cuttlebug with the Swiss Dots Embossing Folder. Beate is back with her Be Inspired Challenge! This week's Be Inspired Challenge #19 used this awesome bedding from CB2 which prompted me to finally use two of the new Stampin' Up! In Colors from the new 2008 Fall Winter Catalog & Idea Book ... Kiwi Kiss and Tangerine Tango. 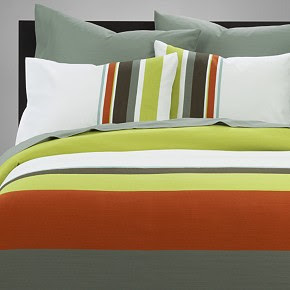 (The other new In Colors are Pacific Point, Baja Breeze, Riding Hood Red, and Pink Pirouette.) Although I ventured out with my new In Colors, I'm still stuck in time with my old stamp sets ... I'll have some new SU Stamp sets coming soon! 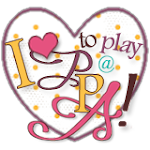 My sideline (Lorri Heiling)'s downline, Adriana Gray ... aka "my niece" in Stampin' Up! language ... and of course, my friend ... mailed a fun care package to me. The first thing in Adriana's package was this wonderful hand stamped card using the new stamps set, Flight of the Butterfly. 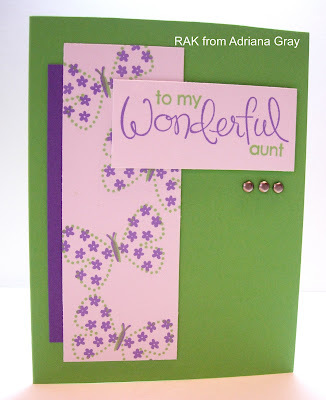 Notice the card says, "to my Wonderful aunt"?! Too fun! At our last weSTAMP meeting, I gave all the weSTAMPERers a tour of my studio. 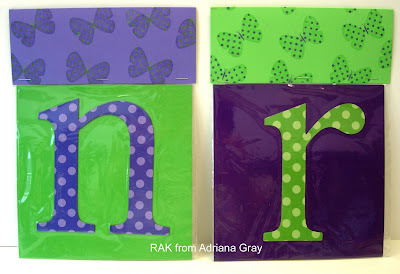 I have several decorative "n's" and "r's" around my studio representing my initials . I told everyone that I love to pick up n's and r's because when I was a kid I hated my initials ... my maiden name was Olson, making my initials "no". I love that my initials aren't "no" anymore ! Adriana mailed these cute magnetic letters to add to my collection. Notice the adorable bag toppers she stamped to coordinate with her card that coordinates with the polka dot letters! Today's Featured Stamper #80 on SCS is Jessica Rone, aka Knightrone on SCS. 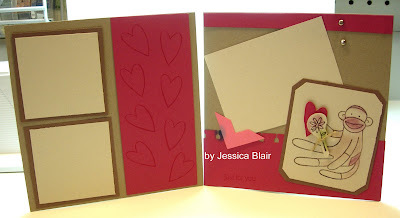 I LOVE Jessica's GALLERY and BLOG, Can You Say Addicted to Stamps .... you will too!!! Jessica is a mega talent, and always super nice by leaving lots of wonderful comments! Congrats, Jessica !!!! THIS is Jessica's card I chose to case. I love the way she combined Real Red with the too often ignored Garden Green ... the color combo is perfect for her snake image! I also love the paper piercing and all the fun embellishments! Things I changed from Jessica's card include: a) different stamp image ... I used the stamp set By Ones & By Twos which made it's appearance in the 2008 Spring Mini, b) different colors ... I used Regal Rose, Pretty In Pink, and Whisper White, c) I used two buttons instead of three because I only had two left. A couple of more things I'd like to point out about this card ... the onesie image is paper pieced, and the scallop border was created with the new Scallop Border Punch. Oh boy did it ever feel good to stamp yesterday! I really should have been cleaning house but my foot is still killin' me (plantar fasciitis) so I thought I had better stay off of it. Lucky for me, I stamp sitting down! LOL! Several days ago, I mentioned that I would be working on tags for my cousin Jami's wedding. The tags will be attached to gift bags filled with goodies given to out-of-town guests when they check into the hotels. 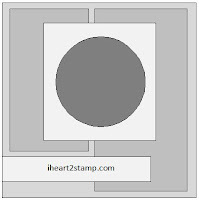 I feel rather silly about any hype I gave to these tags in my previous post because to the eye of any fellow stamper familiar with Stampin' Up! stamp designs, this is a simple simple tag design. BUT, to the eye of someone not familiar with SU stamp designs (like the bride & the majority of the wedding guests! ), it looks like a very detailed, intricate design. Jami freaked when she saw these tags and even showed them to her cake decorator wanting her to duplicate the design on the wedding cake! That's what I've always loved about this stamp set, Baroque Motifs! ... simple to use with elegant, fascinating results! I needed simple because of time limitations, and I needed to make 50+ of them. Jami & Rob's tags were stamped in Close to Cocoa and Certainly Celery. The word "welcome" is from the stamp set, Warm Words, and Diamond Stickles (non-SU) were used in the flower/starburst centers. My apologies for the not-so-great photos ... I'm at my new job during the best lighting for photographing my artwork ... I'm going to have to work with that. 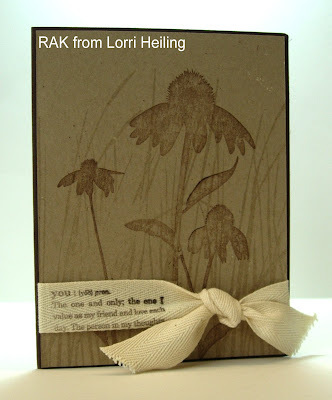 Super sweet, thoughtful Lorri Heiling mailed this beautiful RAK to me using the new stamp set, Inspired By Nature. 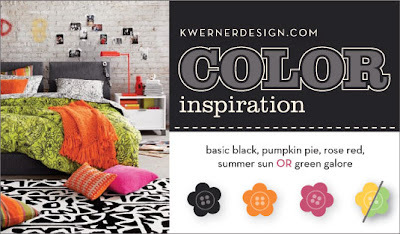 You'll find it on page 100 of the new Fall-Winter 2008 Idea Book & Catalog. I love how Lorri stamped the "you definition" from Define Your Life on the Twill Tape! CLEVER! Someone asked me the other day what a RAK was. I forget that there may be readers new to the stamping cyber world. RAK = Random Act of Kindness. 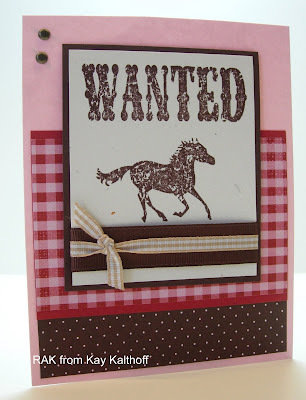 Whether you're a Stampin' Up! Demonstrator, a wanna-be SU Demo, SU Customer, or a wanna-be SU customer, it is such an exciting time of year! 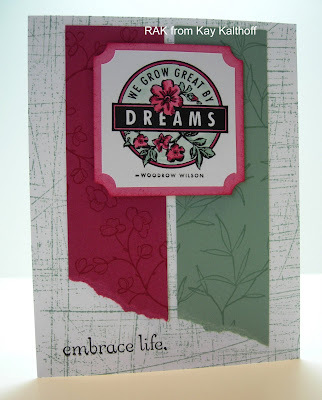 Not only is Stampin' Up! 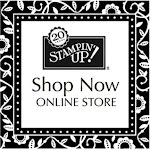 celebrating it's 20 year anniversary, and not only can we order from the NEW Fall-Winter 2008 Catalog and Idea Book tomorrow ... Monday, August 11 ... but Stampin' Up! has new products, new specials, and new opportunities like I've never seen before! 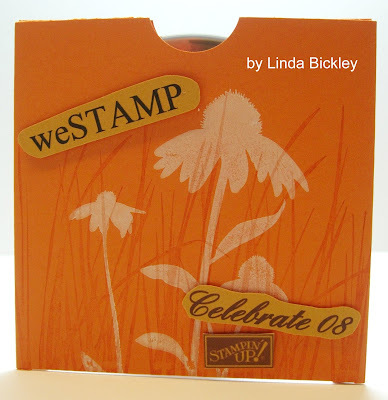 I'm assuming that you'll be able to view the NEW Fall-Winter 2008 Catalog & Idea Book on the Stampin' Up! website, effective tomorrow, Monday, August 11. The first is the introduction of the Big Shot Die-Cut Machine. Stampin' Up! 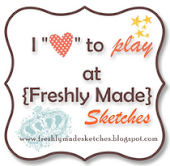 has partnered with Sizzix to be able to offer the Big Shot with many of their own EXCLUSIVE dies. Read about all the Big Shot details HERE. Stampin' Up! 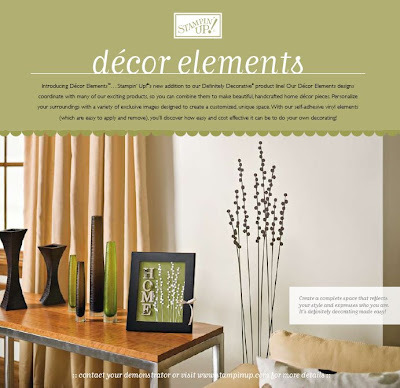 has introduced a new product line called Decor Elements ... vinyl artwork for walls, mirrors, windows, or other hard, smooth surfaces.. You can view the current Decor Elements available HERE with additions to the current product line to come! From August 11 through September 30, Stampin’ Up! is providing Never-Before-Seen savings on brand-new stamp sets: 15% off select new, die-cut stamp sets from the Fall-Winter 2008 Idea Book & Catalog--no additional purchase necessary. Click HERE for a larger, readable view of the Never-Before-Seen promotion flyer. Stampin' Up! 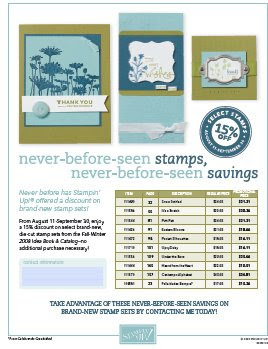 has offered the Catalog Sampler, a publication showing a sampling of products from the NEW Stampin' Up! Fall-Winter 2008 Catalog & Idea Book. View the Catalog Sampler HERE. Along with the Catalog Sampler are THREE special offers ... the first is the previously mentioned Never-Before-Seen special, and the 2nd and 3rd are ................. New Recruit Incentive: August 11-October 11, 2008. 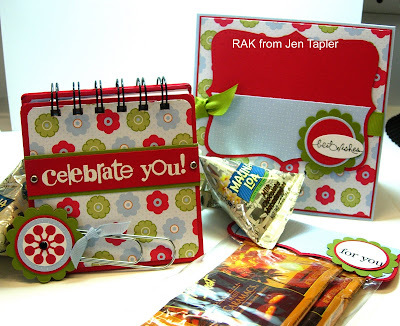 Join as a demonstrator with the standard $199 Starter Kit and choose one stamp set out of the Fall-Winter Sampler or Idea Book & Catalog for free. Hostess Incentive: October 1-November 30, 2008. 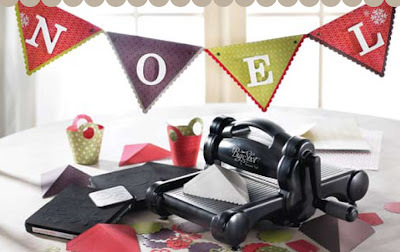 Host a $350 workshop and choose one stamp set from the Fall-Winter Sampler for free. There's still ONE MORE special I wanted to share with you! ... the $99 Starter Kit Promotion. 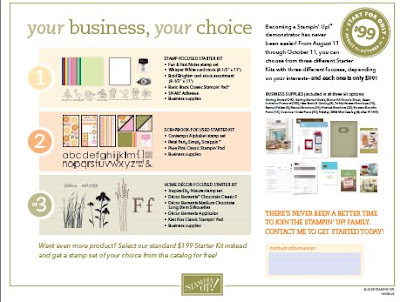 From August 11-October 11, you have the opportunity to become a Stampin' Up! Demonstrator by purchasing one of three special mini Starter Kits* priced at only $99. Click HERE to view the $99 Starter Kit Promotion details in a larger, readable view. This is alot to keep track of and absorb ... at least it is for me! So, if you have ANY questions, contact me ... nrileycm@cox.net ... and I'd be happy to answer any questions you may have! Just want my fellow bloggers to know that if you've noticed me unsubscribing to your blog through Feedblitz, I'm still a loyal reader, but through Google Reader. My e-mail inbox is so much more manageable! 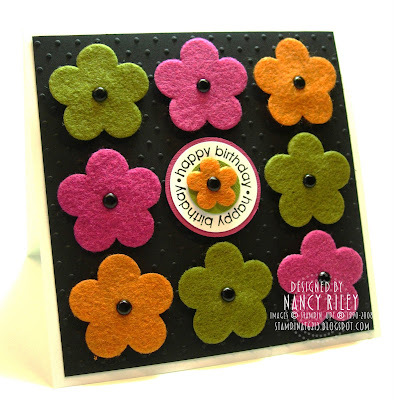 This card uses Kristina Werner's Color Inspiration Challenge #18 of Basic Black, Pumpkin Pie, Rose Red, and Green Galore OR Summer Sun. Kristina moved up the deadline for inclusion in the round-up and I missed it. What is a working girl to do?! 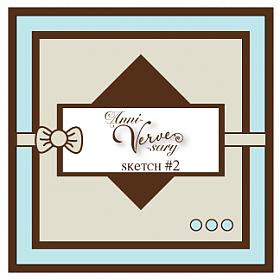 I also used Julee Tillman's Anni-VERVE-sary Sketch #2 on SCS. Julee always comes up with the greatest sketches! I'm going to have to learn how to do it someday! Since I had so many sincere well wishes for my return to the workforce, I wanted to provide you with a quick post to let you know that I survived my first day back to work! 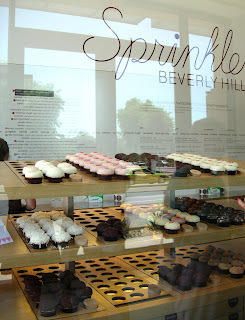 Someone asked if I was working at Sprinkles (from my previous post) ... NO, but sounds like a fun and fattening job! I'm working at my son's K-8 school as a Paraprofessional, working with special needs children. Today was an easy day, as I sat in an auditorium all day listening to people talk. Tomorrow, I work at the school to get all the details about my new job. Monday is the real test ... the kids' first day back to school! Thanks for all your encouraging comments and e-mails! You've given me the courage to tackle this huge change in my life head on! Thank you for that !!!! Can't WAIT to stamp this weekend! My cousin, Jami is getting married in September and asked me to design a tag for the gift bags that will be given to the guests checking into hotels for the wedding. She flipped over the first design I showed her, and am making 50 of them for her this weekend. I'll be sharing them with you when they're done! Good 'ol Lorri Heling mailed this birthday card to Allie for her birthday yesterday using one of the new stamp sets you'll find in the new Stampin' Up! 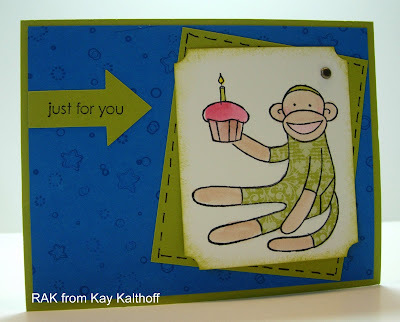 catalog - Sock Monkey ... AND new designer paper, Bella Rose and the new Scallop Border Punch. I laughed out loud when Allie opened Lorri's card! You see, I've expressed to Lorri several times how much I dislike this new stamp set and she just HAD to send this card to my house to get a rise out of me! I know many of you love this new stamp set, but I'm sorry -- it just gives me the creeps! 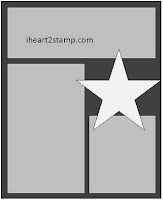 There are very few stamp sets from Stampin' Up! that I've ever disliked, and this is one of them! I can't help but see this sock monkey in a horror movie or something! Weird, huh?! Lorri, even though the set isn't my favorite, I DO love your card!!! See all the details for Lorri's card HERE. Today, my daughter Allie turned 17 !!! What a fun day we had! Allie and I drove across town to Scottsdale Fashion Square for some shopping. We refused to fork out a bunch of money for a high school class ring last year and told her we'd like to buy her a nice right hand ring. Today was the day, and we found a nice affordable one that she loves. (do you KNOW how much class rings cost these days?!!!). Before heading home, Allie and I stopped at the cupcake store, SPRINKLES! WOW! Talk about delicious! Their website is www.sprinklescupcakes.com. Speaking of amazing cakes and cupcakes, you've GOT to see THIS too! Allie started marching band practice today, and our family went out for dinner this evening in between her practice and band council meeting. Allie's best friend, Britt was able to join us too! You know how I've been talking about changes the last couple of days? 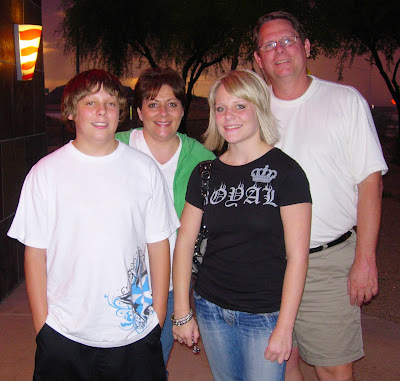 Here's another one ... my daughter turned 17 and is starting her Senior Year of High School! Whoa! Time needs to slow down ... NOW! Notice the title of this post? ... "CHANGE". I'm finding myself in the midst of alot of change right now (and don't ask me how well I'm handling it! ... you don't want to know!). I've never adapted to change very well, and the older I get the worse I get at it! On Thursday I'll be starting a full-time job after 13 years of being a SAHM. I'm going kicking & screaming all the way, as I have no idea how I'm going to work full time, keep up with my kids' activities, keep the house clean, cooking, shopping, laundry AND find time for something I LOVE - stamping. I know there's lots of women out there that do it, and I'm sure I'll eventually get the hang of it. Until then, I won't be posting on my blog as frequently as I once did. It makes me sad that I won't be able to nurture my blog like I've done over the past year+. I have many loyal readers and approx. 1,000 subscribers, and don't want to lose a single one of you! This isn't good-bye ... I just wanted to let you know why I won't be posting as frequently. My heart will be here because this is something I truly love doing, but I can't physically be here as often as I'd like. Surely there's someone out there willing to pay me an hourly wage + benefits to stamp and blog! LOL! If you're a local customer of mine, I hope to resume monthly classes in September. Thanks for your friendship, understanding, words of encouragement, and most of all - your prayers. Sweet, sweet Jackie Pedro mailed this beautiful card to me!!! 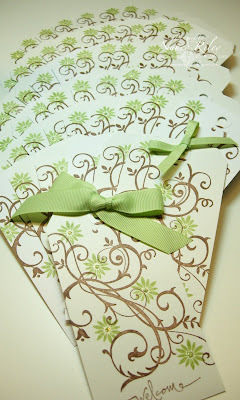 Visit Jackie's blog, The Scalloped Edge, to see more of her beautiful artwork! I have the most generous new friend! Kay Kalthoff, Stamping to Share, sent me a sampling of her convention swaps! I can't believe how incredibly sweet this was of her! She knew how much I wanted to be at the Stampin' Up! 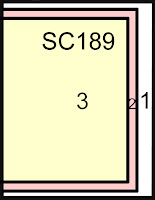 convention in Salt Lake City this week, and there's nothing like swaps to make you feel like you're there! Aren't they great?! 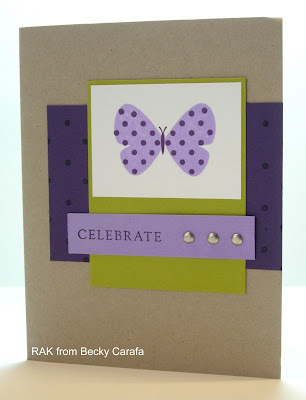 You can find all the details about these cards HERE on Kay's blog, Stamping to Share. After hearing about how fabulous convention was, I'm convinced that I'll be there next year! Thanks Kay! To all of my fellow SU Demos --- I hope you all had a fantastic time at convention!! !